Brian, I don't know why did I not think of you for this project? You are perfect for getting this done and done right! I must be slipping a bit. This is probably the best photo that I can come up with but I can photograph my 'metric' speedo and provide dimensions or as you often prefer, I can send it to you! 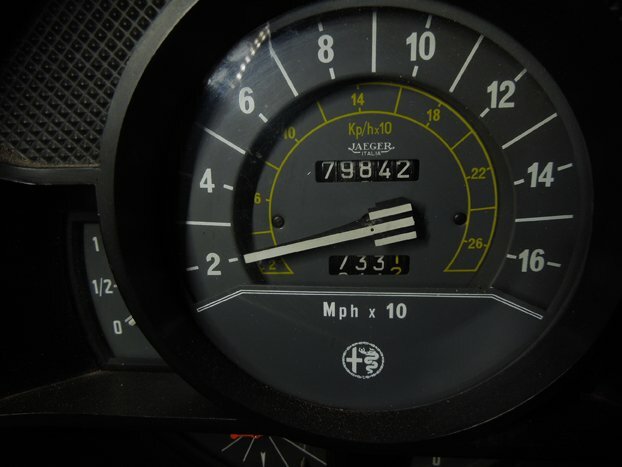 You've probably read the thread but we could use a clear plastic film type speedometer overlay with Imperial measurements on the inner ring in yellow. Similar to Dom's photo above but the metric speedo lacks any inner MPH indicators as necessary. I can do the mental calculation pretty fast but it is usually done just after I pass a cop! How would the overlay attach to the speedometer? Anything that is peal and stick would show and look fairly ugly. The face of the speedometer looks to be 3D. Is it one piece or two pieces? looks a one piece, dished shape. As I understand, the speedometer overlay was printed on a piece of thick 'static cling' type plastic. I have not actually seen one but understand that John Justice has a NOS overlay and that Delmas Greene is using one on one of his two Montreal's. I'll request a photograph. I made an overlay on a piece of static cling material with a Sharpie. It was fugly and hard to see. One day I peeled it off and threw it away; I kind of regret doing that now. 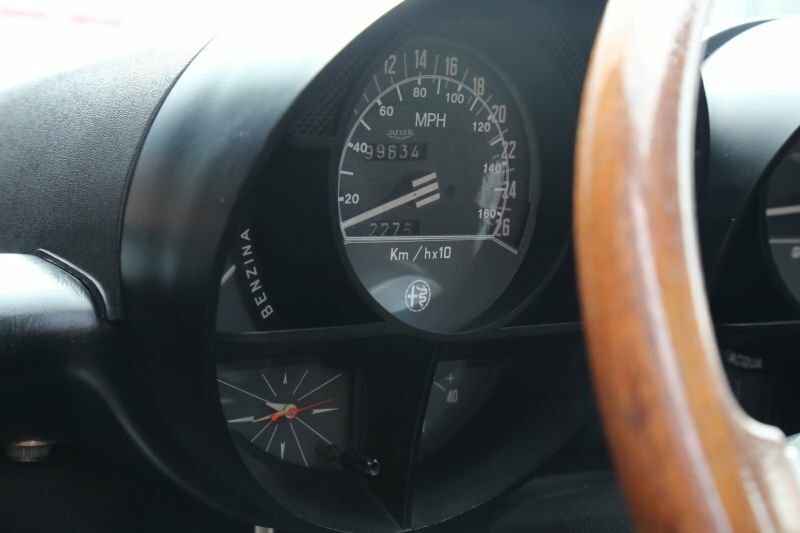 The inner ring on the speedometer face is 'stepped down' or "3-D" as you say. If a static cling is what you want, we can make that happen. Do they actually cling to plastic? The printer I use can print on static cling. I'll have to approach them for a sample to see how it sticks. Brian, that sounds great! 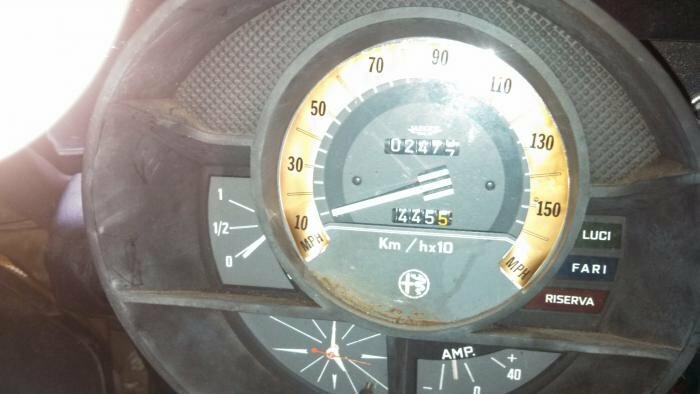 The photo Dom showed in post #27 shows a metric speedometer with Imperial units on the inside ring. I didn't realize it at the time he posted the photo but this must be a modified unit. It either has been re-printed or has an overlay. I just followed the link provided to see if the speedometer had been modified and if the modification was described or not and realized on the speedometer Dom posted -the link was for a very nice looking Montreal that was for sale. 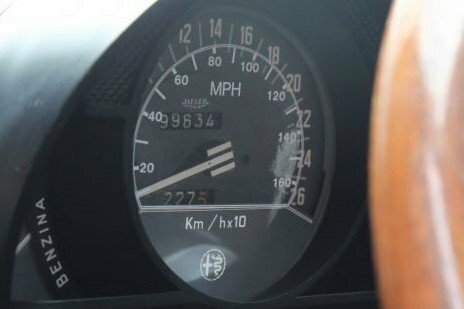 There was another speedometer photo in the link -that makes me think this has an overlay applied to the speedometer plastic screen cover. I can't tell if it was applied inside or outside the clear plastic screen but outside would be much easier to apply. This is functional but not quite as aesthetically pleasing as the above speedometer modification. Last edited by IRONBLOCK; 04-14-2019 at 08:04 AM. It's possible the speedo is shared with another Bertone designed car. But who knows. The Montreal gauge cluster is unique to the Montreal. Mark, I'll reach out to the printing company I use and see what they say about the clings. I think a cling would be okay, so long as it's applied correctly (without air bubbles). I thins picture, whomever made the graphics, added a nice line along the bottom that can be used to line up the decal with the gauge. That line on the bottom will help with alignment but it also goes up and around the gauge with hash marks and numbers around the gauge face. I think it would be helpful to print the above using yellow ink. If you use the numbers as shown below, no " /hrx10" would be needed. Last edited by IRONBLOCK; 04-15-2019 at 05:14 PM. I found this RHD car with the same speedo. This is going to be a very interesting challenge. I'm rather particular about the details and will probably need to get one of these in my hands. The lines at 2,3,4,5,6.... are at some unknown angle. I'll need to replicate those exact angles so that I can figure out where the MPH "lines" are supposed to go. If anyone has one of these clusters disassembled, a high resolution scan (not a picture) of the speedo face would be most appreciated. If I can't get that, I will have to figure all of that out with a protractor. Remember those? Brian, that is a true Imperial units speedometer with metric numbers inside, like Robo330's (Karl's) photo below yours. Most of us have metric speedometers, which unfortunately did not come complete with any Imperial units. just a little detail, but as details are important, note the original "lines" are not actually solid. Thank for the picture. It's no problem for me to draw this kind of detail.